Quite the ominous bogey on your 6 there, chief. Black tiles? Downright devilish, Activision. Word to ya moms, we came to drop bombs. Sega’s first console, the SG-1000 received the groundbreaking RPG The Black Onyx as its final game in 1987. And while the port wasn’t very good, the fact that it existed on the system at all was a testament to Sega’s development teams. An honest-to-goodness first-person dungeon crawler with a four-person party should not have been possible on the SG-1000, but by gar, Sega pulled it off. Despite the Mark III being Sega’s main focus in ’87, The Black Onyx‘s release implies that they cared enough about the SG-1000 to bless it with a parting gift. So what to make of Bomber Raid? 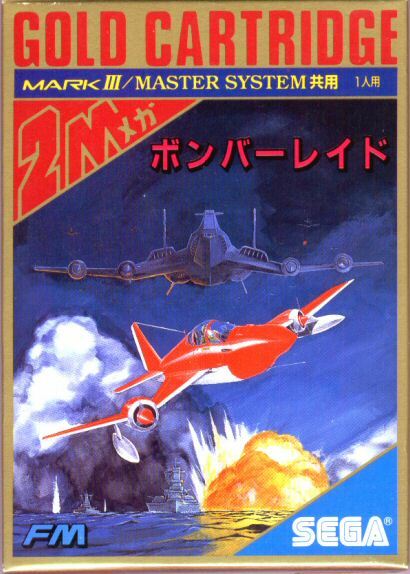 As The Black Onyx was the SG-1000’s final game, so too was Bomber Raid the Mark III/Master System’s last game released in Japan (America, Europe, and Brazil would see many more years of Master System releases). 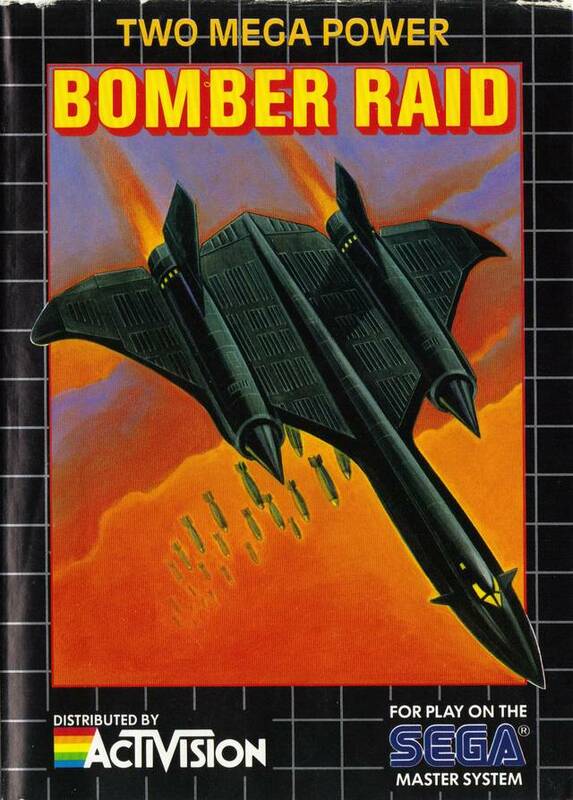 Compared to The Black Onyx‘s ambitiousness, Bomber Raid – an inauspicious shoot-em-up that shamelessly cribs its style from Capcom’s 19XX series – feels tired, like Sega couldn’t have been bothered to put forth real effort into the Master System’s final game. Gray planes on loan from The Capcom Collection. In Bomber Raid, you’re a fighter pilot attacking other planes, tanks, and helicopters in the wild blue skies of wherever-the-hell. When you first start the game, your plane moves slowly, like it just got out of bed. Your pea shooter is pathetic, and your secondary weapon – a bomb blast that destroys anything in front of you – has a limited amount of uses. Shoot the multi-colored UFOs that appear every other second to gain weapon upgrades, additional speed, and the occasional special power-ups. Your speed tops out pretty quickly, but it will take at least three stages (out of a mere five) to fully max out your weapon. The special power-ups – red pellets numbered 1 through 4 – give you an extra smaller plane that attaches to your side, diagonally in front or behind you, or on your bumper, depending on the number you collect. These little planes shoot in different directions than you and function as both extra firepower and a shield, of sorts. Somewhere in the jungle, Francis Ford Coppola is screaming. The bosses are essentially enlarged versions of the enemies you fight in the game. Aircraft carriers, naval ships, extra large bombers, the gang’s all here. You’ve fought these types of bosses before in 1943. They’re uninspired, and if your weapon is strong enough, they will die very quickly. At first, Bomber Raid plods along without much activity. 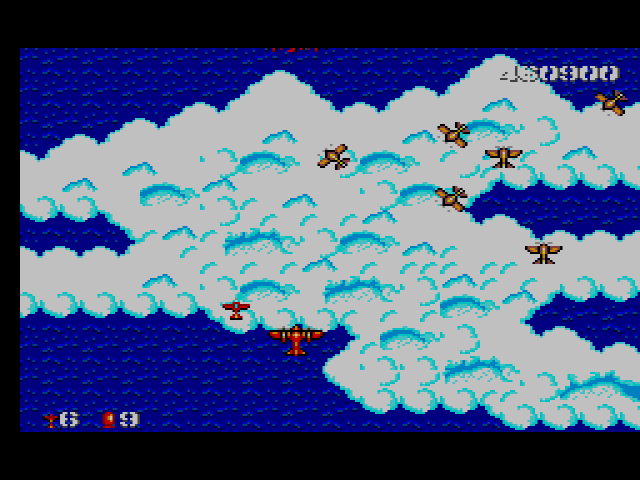 Enemies are sparse, only occasionally shooting at you before you kill them or they fly off the screen. The power-up UFOs come so frequently that it’s impossible to not be somewhat powerful. Around level three, however, the game gets ridiculous. 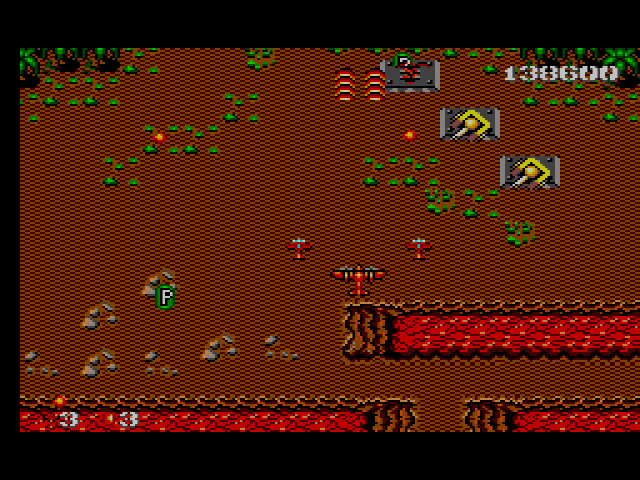 Enemies start mingling together, emerging from all corners of the screen with different movement patterns. UFOs emerge at the same rate, but power ups are often lost within the constant enemy swarms. While the extra enemies liven up proceedings, the increased difficulty coupled with Bomber Raid‘s lack of creativity means that only diehard shmuppers will have the strength to finish the final raids. 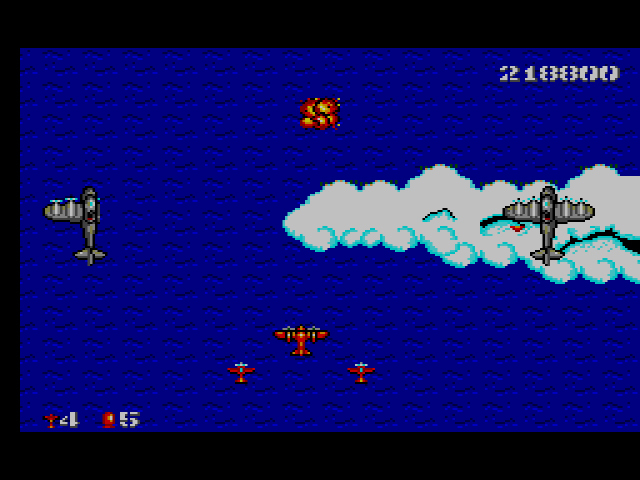 Bomber Raid is completely playable, but there’s nothing that makes it stand out from similarly playing shoot-em-ups of its day. 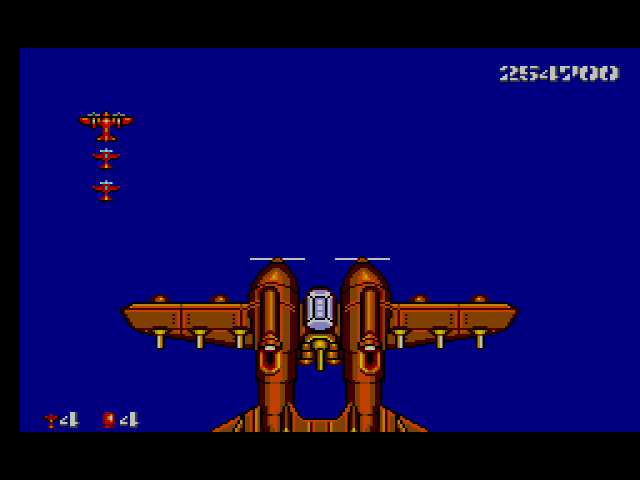 And compared to other Sega shmups like the cutesy Fantasy Zone or the unrelenting Power Strike, Bomber Raid does nothing for one’s imagination. But the game wouldn’t be such an affront if Sega hadn’t positioned it as a sendoff for the Master System in Japan. The console may have never achieved widespread popularity in its home territory, but it still deserved better than this nondescript farewell. Previous Article Where in the World is Carmen Sandiego? I didn’t realize this was the last release in Japan. Sega of America had many more releases, and I always thought the Mark III was more successful than the US Master system. This brings up an interesting point – were the rest of the american releases made by Japanese or american developers? By now, Sega’s attention was was probably focused on developing the mega drive and they wanted all their internal resources working on it. About the game itself, I think the review is accurate as I remember playing it and not being very impressed. I dont think I managed to complete it, which is something I was strived for on all games I played back then. I kind of answered this with my post but yes Sega continue to release SMS in the US and EU that were developed in Japan. I’d have to look it up, but I’m pretty sure the install base was much bigger in the US than in Japan. For sure numbers wise. (And actually worldwide the SMS was actually very successful.) but I think percentage of the market share as well. If Wikipedia is to be believed, SMS sold 2 million in the US, and nearly 7 million in the EU. And over 13 Million worldwide. Compared to 1 million in Japan. In fact the SMS is the longest selling console in history as the are still selling new ones in Brazil. The Master system was way more succesful when you put the worldwide numbers in perspective. It gets a bad rap in the US, but actually worldwide it has sold more than the Wii U (10 mil) which is most likely near its end of life. Anyway while this was the Last SMS game in Japan. It was not the last SMS game from Japan. Sega Japan continued making games for the American market. Just never releasing them in Japan mostly due to the Mega Drive being their main push and totally abandoning the Mark III in their home country. Famously Wonder Boy III the Dragons Trap had a Japanese localization and title screen. But only ever came out in the US and Europe. Apparently at one time it was going to be the last Japanese SMS release before canceling there. True, you’re right, it’s not a Sega-developed game. But Sega still published it as their last title in Japan, and… that’s just sad, is all. I get it, the Mark III/Master System wasn’t popular there, but c’mon. It is kind of a shame. 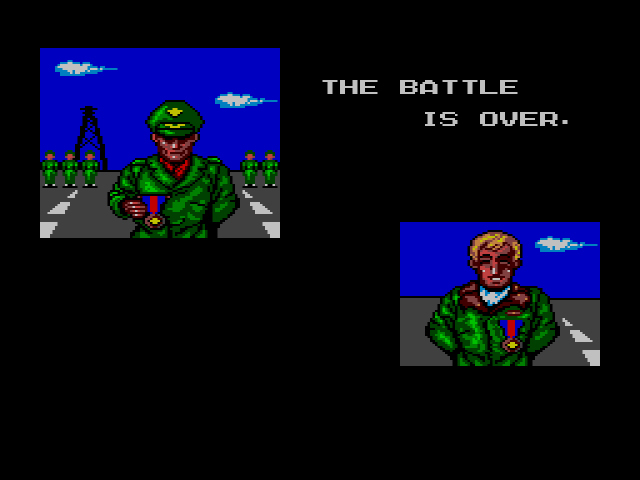 But 1989 did see some really good SMS games come out in the US. I’m sure most of them were scheduled in Japan. They just killed it. I think Europe got the best end of the deal as they got a lot games we never got because they finally discontinued the SMS here. It truly was I think literally really a victim of Nintendo. Due to their anti competive business practices with third party’s. I think the only third party games in Japan were those two Salio games. So Sega had to publish everything themselves. But I am glad Sega continued to make quality games for the system overseas and not totally discontinue it. I know people who love the SMS Sonic. Golden Axe was supposedly a really good port. Wonder Boy III may be one of the best 8-bit games or at least in the top 10. I am really looking forward to you 1989 games. But even more, I am really looking forward to 1990 and later. Because most of those games are a mystery to me as I upgraded to the Genesis and never played the late 1989 games or anything after. I really look forward to what I missed out on. Forgot to mention that the GG is probrably the reason SMS support continued. With it being basically a portable SMS it was easy for Sega to develop new games and release them on GG and the SMS. With the GG having a larger color pallete, but a lower resolution. This is a great point. I’ll mention it (and credit you) when I write my Game Gear piece. Interesting review, I also didn’t realise support stopped in Japan so early. As stated there are many years of support and titles ahead particularly in Europe. Great post as well Sean, perhaps this may have sold better being named ‘Super River Raid’ or Bomber Raid: River Raid 3 – maybe ? I don’t think that c- is too fair. The graphics are nice and it controls good too. I’ve never been a huge fan of shoot em ups but this game is as fun as any 8 bit in the genre. I’m pretty sure I remember a level select code that helped me finally beat this game. 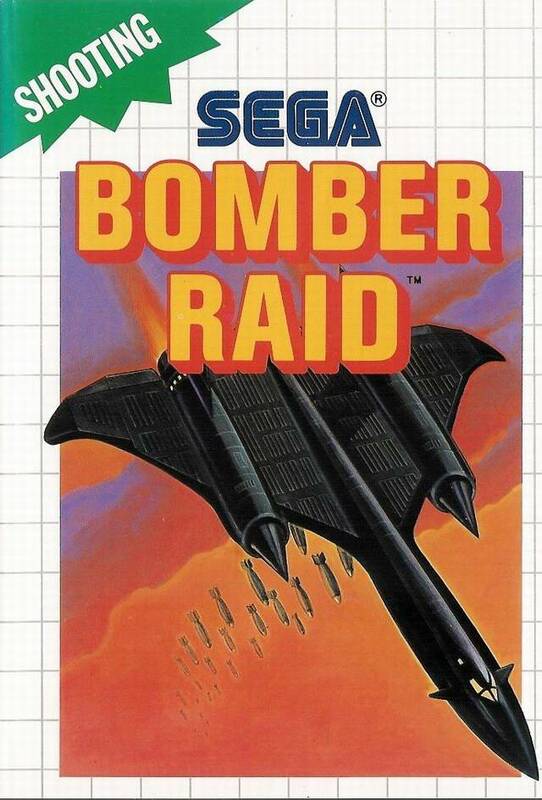 Having played my fair share of shoot-em-ups on the NES and Master System, Bomber Raid stands out for how bland it is. Plus, all of its ideas come straight from Capcom’s 19XX series.